As a design and development agency we have worked in may ways, for some years we even had a big office with many people working there. For the last 4 years we have been working from home. For many projects we “call in” contractors and work remotely with them, most of whom we have never seen in person. One problem has always been communication, even with people working in the same space. As anyone who has worked in a team knows, communication is essential for getting things done right the first time around. And most have already realized there is no magic bullet. Even when people share the same space “communicating” can interrupt others, or there are times when everyone is with the headphones on, banging their heads at different rhythms. But my latest experience has been on distributed teams. For the last year we have been a partially distributed team and since January a fully distributed team. Though it’s only three of us, working remotely with even one person is challenging. Even if you normally work well in presence of someone there’s an inherent lag of communications as well as a lack of channels. Historically when we had remotely worked with other people, the best we could achieve was to work with them as if they were a contractor, we defined the task and checked a few times a week how progress was going with a Skype call, but that is not collaborative work. Everyone knows how to do email, we have even agreed to a certain etiquette, but it isn’t much more sophisticated than snail mail. While nothing beats a telephone call in terms of simplicity and standardization you must guess when the other person is going to be available. While these are often good enough for dealing with customers they are event based communication, there is no continuum. A more sophisticated way of calling someone or having a group conversation, one where you can also type and attach stuff if you are not on the phone. Lag is evident in most calls, sometimes it makes it impossible. The most common are Skype and Google Hangouts. But leaving the chat always on takes a toll on the connection and it ends up being weird. Audio of the other people typing or having phone conversations is coming all together from the speakers, which makes it really hard for the brain to discard it as background noise. It’s worse with headphones. You don’t actually need that much flow of constant information. From IRC to Snapchat there’s plenty to choose from, some have quite good search capabilities. Sqwiggle is like a virtual office space, with people present but silently working in the background. Where if you want to talk to them, you just click or tap on their picture. And the picture is updated every minute, so you get a sense if that person is in front of the computer and how concentrated or frustrated with something they are. Just like in a physical space, you can tap someone’s picture (or shoulder) and start a conversation. But it can be used for a lot more. Sometimes when I’m away, my wife sends the kids to where I work and points the camera to them, so she can keep an eye on them and call their attention if she sees anything unusual. Now with the iPad app it’s even easier. It’s mostly seeing the faces of the people you work with, the green dot in a chat telling you that the person is available or not has never been very reliable. We tried with Google talk… chat… hangout… whatever-they-are-calling-it-now* and it feels detached after working with Sqwiggle, you miss “seeing the people”, seeing their expression change. And with Google sending files is not as straightforward, not to speak it doesn’t have code with syntax highlighting. Good for getting something out of the way, but not an everyday tool. Oh, support is very nice. 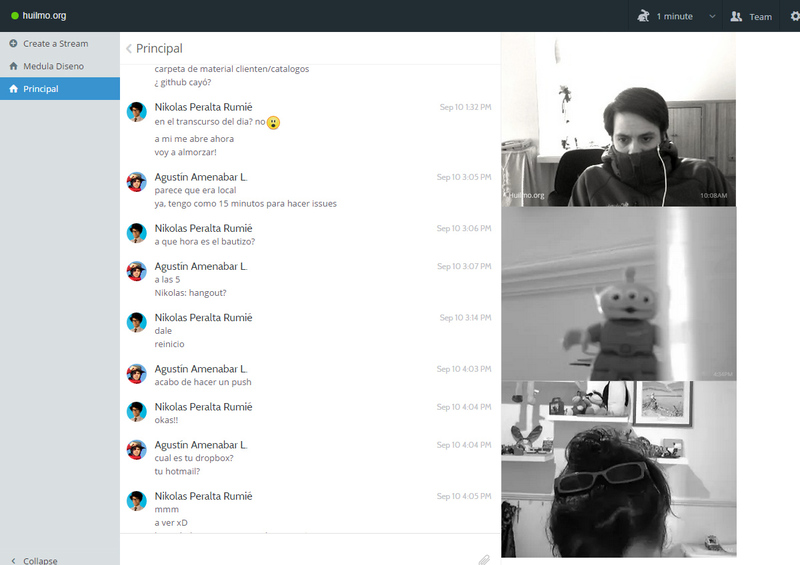 Very nice people, the actual people who work in Sqwiggle get in touch with you. Don’t get me wrong, Atlassian’s tool is very powerful tool, way more powerful than Sqwiggle, has tons of features, but it feels like having a meeting in a Starbucks inside a groceries store; too much stuff you will try to use that you don’t actually need. We don’t need a colorful notification when someone has committed code to repository-n, branch-x. Your team mate can just as easily type: Just pushed several changes to fix this or that , he knows to do so only when it relevant to the team. You get far less noise when humans decide what to share with the team. Even though Hipchat has a nice Android app and good integration with tons of APIs, Sqwiggle feels more natural, it’s clean and out of the way. Mostly, a smartphone app. Most other things that we wanted have been steadily being added. Like timeline search and screen sharing that is coming out soon. If you work with at least one other person, give it a try for a month. It’s well worth a try. And it’s not like you need to set up anything up or that you loose anything if Sqwiggle goes away. It’s just there, it doesn’t ask you for all your friends details or anything. It’s like a friend. 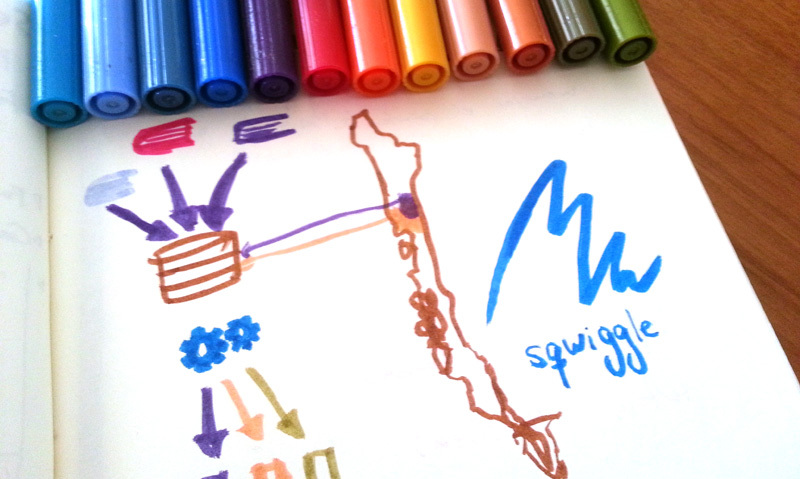 I would venture that Sqwiggle is the centre of our communications as a team. We even paid for the app when there was no free plan. Even though I had been contemplating for a while writing about Sqwiggle, it was when they contacted me to get my feedback on the app, that Michael gave me the final nudge to write this. Apart from that I have no relationship with Sqwiggle, (I’m even on the free plan).